Simson was started in the southern portion of East Germany in the Suhl region by two Jewish brothers. The roots go back to the mid 1800s when they were a weapons manufacturer. Like so many others, they diversified into bicycles around the turn of the century. They then progressed to making automobiles, including the famous Simson Supra. It was not until the depression era in the 1930s, that they entered the 2 wheeled market with a 98cc offering. Although they got off to a good start, the Simson family was forced to flee the country by the Nazis. The factory continued to produce, but WWII quickly interrupted production, as the government was more interested in the continued production of weapons. Simson ended up as part of the Russian zone following the war, and portions of the factory were carted off to Russia as reparations. What remained was slowly returned to being functional. Their next 2 wheeled vehicle did not emerge until 1952 when they introduced the SR-1 50cc moped under the AWO label. It was followed by the much improved SR-2 model which sold well. The evolution continued into the AWO 425 model which had a single cylinder 4 stroke 250cc motor, shaft drive, and a four speed gearbox. A sidecar version of this bike was also produced. More impressive though was the competition version which began competition in 1954, and came home with the 250cc national championship in 1954, 1955, and 1956. This really bolstered Simson sales in the market, and they naturally produced a more sporting version, the AWO 425S, as a result. 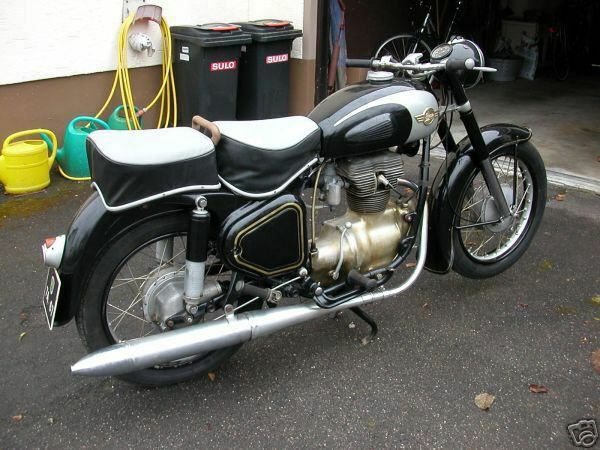 Then in 1958, they introduced the Renn Sport model (RS250). This bike, in the hands of racer Hans Wienert, won back to back titles once again in 1958,and 1959. In all, more than 300,000 of the 425 machines were sold. Shortly thereafter, the eastern block industrial management restricted Simson to machines 100cc or less, while MZ was to be the home for machines greater than that (see Muzings). Along with the dominance of 2 stroke machines, this ended the 425 competition phase of Simson. However, the company continued to produce mopeds and scooters. The Schwalbe model in particular sold over a million units and remains very popular in Europe with a large cult following. Simson remains in business today producing scoters, mopeds, and bikes up to 300cc.